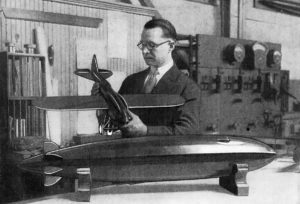 R. Smith, chief draftsman of the wind tunnel at the Washington Navy Yard, holds a model of the original landplane version of the Williams Mercury Racer. Lt. Al Williams was originally not focused on the Schneider Trophy contest but was later convinced to enter the event. Early last week Bob Martin sent me a link to an interesting article he found on William Pearce’s “Old Machine Press” – “New Memories of Old Machines” blog. William’s blog is full of great articles about aircraft piston engines, World War II aircraft, and air racing. The link Bob had sent me lead me an article about the Williams Mercury Seaplane Racer of 1929. Williams did not originally intend the Williams Mercury Racer to be used in the 1929 Schneider race. But the US had won the Schneider Trophy two out of the last four races, and another win would mean permanent retention of the trophy. With the Williams Mercury Racer now a seaplane, Williams relented to pressure and agreed to work toward competing in the 1929 Schneider Trophy contest and to attempt a new speed record. Once I finished reading that article I decided to have a look around and see what else I might be able to find of interest and low and behold I discovered two more articles about this racer and the engine that was developed for it. The links below will take you through the entire set of articles in order. Enjoy. Thanks Bob for sharing the original article with me.